Pointy metal thingamabob. Rinse. Another pointy metal whatzit. Floss. Rinse again. Spinning tooth-cleaning gizmo. And those metal thingamabobs? Hygienists have (nearly) 20. But what are the actual names of the hygienists’ tools and how do these gadgets get your teeth so clean? Circular, handheld mirrors help hygienists see part of your mouth’s world. They can peer into nooks and crannies, as well as check for tartar and decay. These mini-mirrors are used while the other metal tools do the dirty work. Probes are made of metal and are hook shaped. The sharp point allows hygienists to check gum health and measure pocket depths around a tooth. There are various types of probes, each one geared towards a specific oral health issue. Scalers are the pointed metal instruments used to scrape away plaque and tartar from your teeth. Curettes are a metal tool with a rounded end. Like scalers, they also scrape away tartar but from underneath your gums. 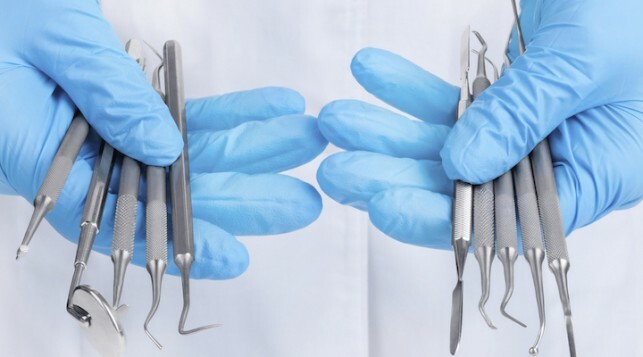 After the scaler and curette do their jobs, your hygienist will pick up the polisher. This tool buffs away uneven areas on teeth to leave a bright, smooth surface. Besides making your teeth shinier, polishers discourage plaque and tartar growth. You might not be part of their world, but now you know (some of) what the hygienists know.